Born on the 29 July in Paris, lives and works in Paris. 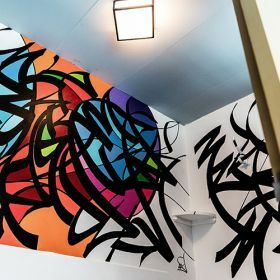 ODN first presented his style of lettering and graphic expression in 1987 on the waste-grounds of Stalingrad in Paris, "the home of hip hop culture". His world is filled with artistic references to the very diverse influences that he uses in his own personal way as he upsets the codes. ODN is talented and insatiable; he works on the limits of text and figuration, reinterpreting the cubism of stained glass. ODN has his own style, made up of forms outlined with broad lines and treated as flat surfaces of pure shadow-less colour. His works stand our through the saturation of the coloured surfaces whose completed nature leaves no place for doubt to subsist. He was at the origin of the "Tag Artistik" movement through which he defends the aesthetic nature of graffiti.